I mentioned in an earlier post that I had some news that I could not yet reveal because it wasn’t my announcement to make. 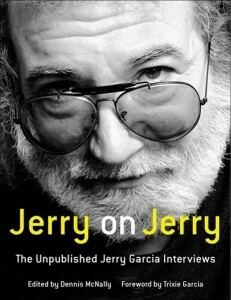 The Jerry Garcia Estate and Hachette Publishers made the announcement this morning. As you might guess, my interviews with Jerry (mostly in the ’80s, one from the ’70s) were fun and fascinating — and there were lots of side conversations that didn’t fit into A Long Strange Trip. So the Estate asked me to edit together the material both as a print book and an audio book (which you simply have to have – he’s hysterically funny). Jerry on Jerry will be out in November. Notes: I’ll be interviewing Trixie onstage to celebrate the release of “Jerry on Jerry,” the book and audiobook of my interviews with Jerry Garcia.